Project Run and Play: Pre-season Giveaway!!! Today we've got a giveaway for you all, just to get you in the mood for sewing for Season 13! The brand new boho collection from Petite Stitchery, just in time for Week 3: Boho! To enter this giveaway, leave a comment below telling us which theme you're most excited for this season. For an additional entry, leave a comment telling us you follow us on Facebook. And for a 3rd entry, leave a comment telling us you follow us on Instagram. Be inspired by the themes. Check out the prize packages. Grab the FREE Project Run & Play Season planner and get busy! I'm most excited about the Boho Chic challenge. Signature Style is my favorite theme. I like the ability to mix and match details according to my style and skill set. I am loving the greenery theme. I am a follower of Project Run & PLay on IG! 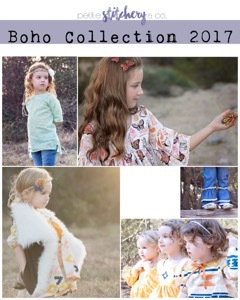 I am VERY excited about the Boho collection by Petite Stitchery!!! Can't wait!!! Excited about the Boho collection! So excited about the Boho Chic! I'm most excited about Boho Chic! My girls are such free spirits! I'm super excited for Boho, but Places has me curious as well! I'm looking forward to Boho. I'm excited about the signature style theme! Would love to see the looks created in that week. I'm so excited for the boho chic and the run and play! I am excited for the Boho style! I am excited about "It's All About That...Place!" I always enjoy what the designers come up with for the Signature Style week! I always love the signature style challenges. I'm channeling my inner Stevie Nicks and I'm all about the boho! Awesome! I always love signature style week! I'm excited about week one, destination! I'm most excited for the travel theme. I'm excited about Greenery. I love that fresh color, and it will be so fun to see and make clothes in that theme! I love Boho!!! looking forward to seeing more!!! I'm looking forward to "It's All About...That Place". Sounds like fun! I'm excited about cheery, springy, greenery week! I'm excited about the green challenge. I love green clothes, but they're so hard to find. I'm looking forward to the first theme - travelling! So excited to see where everybody dreams to go! I am excited for the "All about that... place"
I can't wait to see greenery! Destination inspired outfit sounds like a fun one! Started following Project Run & Play on Instagram. I always love the signature style. It helps me learn about myself and my style! I can't wait to see the Boho Chic! So cute! I follow in Facebook. I think the travel inspired theme interests me the most. I'm most excited for the boho challenge. I can't wait to see what everyone makes for Greenery week-- I love green, but it is sadly lacking for my daughter's wardrobe... hopefully we'll pick up some inspiration! My fav is "All about that...place"
Can't wait to see the 'signature style' week! I like the boho week, because that is mine and my daughter's main style, but I am really excited about the greenery challenge. I almost never use green as a main color for her, so I can't wait to see the results! I'm excited to see the greenery challenge. It will be interesting to see all of the participants take on this challenge. I'm most excited about the signature style theme! I will definitely try to sew along that week. I follow Project Run and Play on Facebook! I'm most excited about the Greenery theme! I love all the themes this time around, but if I had to pick a favorite I think I will have to say week one, location inspiration! All the themes sound very interesting but I'm most excited about the Pantone color theme. I think the place theme sounds really cool!!! !